Goal time to OR is <24 hours as a hip fracture needs urgent surgical repair. Getting to the OR within 24 hours is associated with improved health outcomes including decreased post-operative complications (pneumonia, hypoxia, arrhythmias, UTIs, PE), lowered mortality, improved pain and decreased rates of delirium shorter length of stay. Orthopedic chief discusses all hip fractures admitted overnight or planned for surgery each day with E1 in the morning. This discussion will include any relevant co-morbidities that may affect surgical planning. Orthopedic On-call chief notifies attending on-call and covering trauma attending as well as University Service Chief and Intern (Attending covering case will depend on when case can go to the OR, if case goes from 1PM to 7PM then ortho trauma attending of the day will cover. If the case goes after 7PM or on weekends then general on-call attending will cover). 1. For patients admitted in the evening keep NPO after Midnight in anticipation of OR next day, for patients admitted in the morning keep NPO for possibility of OR the same day. Hold, record time of last dose taken clearly. Clearance dependent on renal function. Generally hip fracture surgery with general anesthesia only can be undertaken 24 hours after last dose for all medications and normal renal function (48 hours for Dabigatran and Apixiban and high risk of bleeding). Risks and benefits should be weighed by teams (ortho, medicine, geriatrics, and anesthesia) for delaying surgery more than 24 hours. If the case requires a total hip arthroplasty the arthroplasty attending on call or arthroplasty fellow will cover depending on availability. If the on-call attending or fellow is not available and the case can go then any arthroplasty faculty available will cover. In order to search for the appropriate booking code type in the alias “thundercat” and the three above codes will appear. 3. Avoid Fentanyl (short-acting), gabapentin (sedating and increased risk of opioid overdose), use cold packs. All patients with hip fractures should receive timely, effective, multi-modal analgesia. 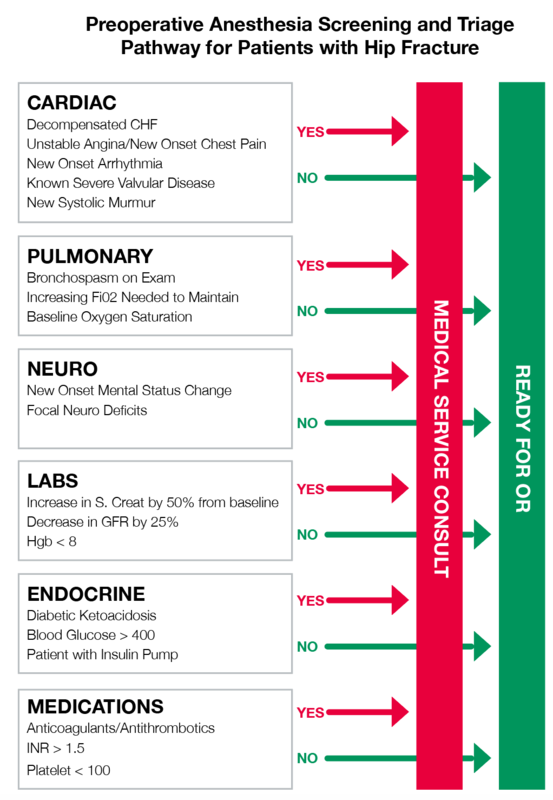 As part of this the Departments of Anesthesia and Perioperative Care, Emergency Medicine, Orthopedic Surgery recommend all patients receive an ultrasound-guided fascia iliaca block (FIB) as soon as appropriate and possible as this has been shown to decrease pain, need for opioids, and assist in timely transfer to OR. If the APS or regional anesthesia team is able to perform the procedure within 2 hours (Mon-Fri, 8am-5pm), then the ED will request placement of a FIB catheter (or one-time FIB, at discretion of APS or Regional Anesthesia team performing the block). If the APS cannot respond within a reasonable amount of time (outside of Mon-Fri, 8am-5pm; or if APS team is otherwise unavailable), then the ED provider should proceed to performing a one-time FIB (or placement of a catheter, at discretion of ED provider). If the APS cannot respond urgently and the ED provider cannot perform the FIB, then the APS will collect the patient’s information and perform a timely consultation at the earliest opportunity to assess ongoing need for FIB. The APS consult will normally not come in from home during weekends or evenings/overnights specifically to perform the procedure. If a FIB catheter is placed, then the APS will follow the patient as a consult service. Note: The FIB should be performed after call to the Orthopedic Surgery consult resident. While it is preferred that the consult resident evaluate the patient prior to or during FIB being performed, the ED or APS teams should proceed to performing the block as quickly as possible in the event of a delay to Orthopedic consultation. Unless there are specific concerns, the FIB should not be delayed until the patient is staffed with or evaluated by the Orthopedic Surgery senior resident or attending physician. Ventilate with 100% oxygen; prepare for intubation. 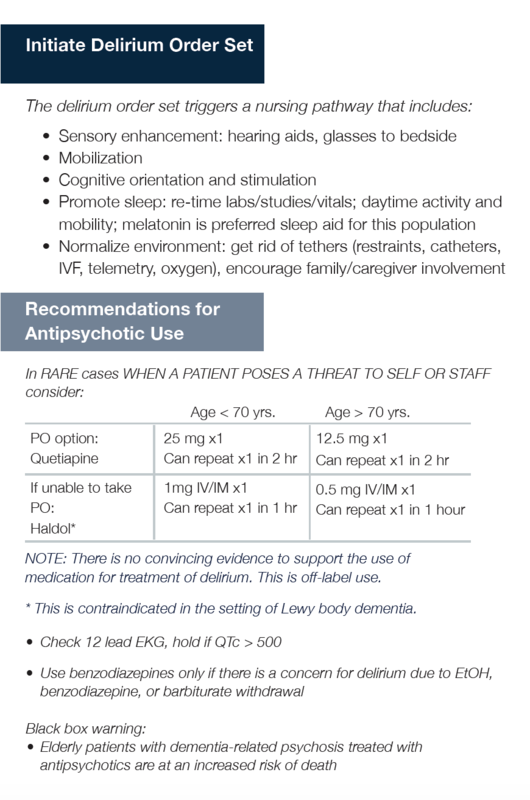 Administer benzodiazepines for seizure activity. Administer 20% lipid emulsion therapy (Intralipid 20%). 4. 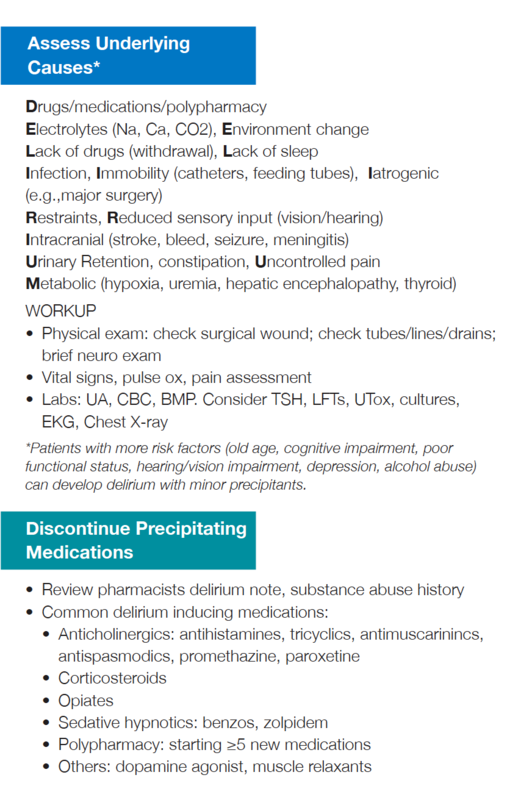 Use non-pharmacolgic treatment, medications have not been shown to treat or prevent delirium.